Impending lay off and it feels so good. Impending lay off like we knew we would. More and more lay offs have begun taking effect at my workplace. My own release date is still a few weeks off. But the goodbye hugs and the “Nice working with you”s have made it all more real. Made me think of that movie from last year, Up in the Air, with George Clooney. I saw it in the theater by myself and I snuck in a calzone. Made me think of one scene in particular, the one when Anna Kendrick’s character fires her first man using the remote system she pioneered. Kendrick tells him over a computer webcam that he’s been fired. And the look on his face. That man’s performance affected me more than the film as a whole. That “truth” makes me feel equal parts suspicious and inspired. Because of course it’s not as simple as that. Being laid off alone doesn’t automatically give you the tools or opportunity to change the world or build an empire. But I do think it can get the fire in your belly burning enough for you to make steps in that direction. It’s been an epic Labor Day weekend. Wedding Four of the summer was attended, thus concluding the Summer of Four Weddings. You know that’s some serious romance because not only did Ovid write about it, but so did Nicholas effin’ Sparks in his book turned movie The Notebook. (Spoiler Alert:) James Garner and Gena Rowlands dead and HOLDING HANDS in a nursing home bed together–that scene alone provided months of vicarious romantic satisfaction. And it’s hard because there’s nothing else to look at in the tunnel really, so you sort have no choice but to look at the ads for “The American” and American Apparel. And then I got to thinking that by placing so many of these ads next to each other, a sort of dialogue on American-ness has been created. 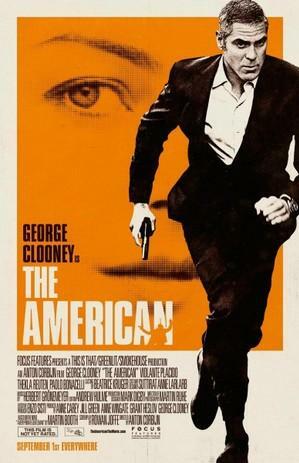 The Clooney ad puts it right out there: “George Clooney is ‘The American'”. In other words, when you look at this ad, he is the representation of all things American and man. And then you look at the American Apparel ad and it’s this young woman and when you look there, she acts as a representation of all things American and woman. I don’t have the energy to make a conclusion about all this right now except to say, there’s a buttload of advertisements in New York. And sometimes it bums me out. Because you can’t avoid it! And advertising people are paid to put ideas into our head about how we spend our money and I think they even put ideas into our head about other things–like what it means to be an American. And what it means to be a man or a woman. Or they play into what they think we think it means to be an American, etc.